This privacy statement discloses what information we gather, how we use it and how to correct or change it. 5. Click the ‘Use’ button - this will instigate the promotion and deduct the discount from the total of your order. The promotion discount will apply to the total of the order excluding ‘ON SALE’ items, redeemed loyalty dollars and postage fees. Only one promotion code can be used per order. It is the customer’s responsibility to make sure the promotion code is correctly entered in the shopping cart, as described above. Promotion discounts cannot be applied to an order after the order has been submitted. Promotional offers are available for a limited time only and cannot be extended. The duration of our Promotional offers will be clearly stated during any of our promotions. We reserve the right to modify, suspend or cancel a promotion at any time, but not after you have placed your order. If you require assistance using your promotional code, contact our friendly customer service team. Visit our Contact Us page for details. We use registration forms. Registration forms require users to provide us with contact information such as names and email addresses. The users contact information is used to facilitate order processing for purchases in the future, as well as to contact users about new ranges, specials and other promotions we may have. Individual user information is never disclosed to third parties. Promotions require users to go through the registration process. In addition to how registration data is used above, promotions use this data to contact winners of the promotion. By emailing us users can request changes or to be removed from receiving future promotional emails. Your information will not be shared, passed on or sold to anyone outside of our business. This information will confidentially remain with us. Should subscribers and customers subsequently choose to unsubscribe from mailing lists we will provide instructions on how to do so in the said communications. On request, we will delete from its database personally identifiable information that has been submitted. For these and other issues related to registration and promotions, please contact our friendly customer service team. Visit our Contact Us page for details. Competitions are open to Australian and New Zealand residents only, who are 18 years of age or over, and are able to take the prize on offer. We do not accept any responsibility for late, lost or misdirected entries/submissions. Your email address and personal details (if provided) will remain confidential at all times and will not be passed on to any third party. We will judge all entries fairly, and in absolute discretion. The winner will be notified via email. The winner will be sent a notification email to the email address provided at the time of entry. We accept no responsibility for unread, undelivered or incorrectly provided email information. The prize must be taken as stated and cannot be varied. The prize, or any unused portion of the prize, is not transferable or exchangeable, and cannot be taken as cash or sold. We reserve the right to re-judge in the event of an eligible entrant being unable to satisfy these terms and conditions, forfeiting or not claiming a prize. We (and each of our related bodies, their officers and employees) will not be liable for any loss, damage or personal injury (including, but not limited to, indirect or consequential loss) whatsoever that is suffered or sustained in connection with this competition or use of this prize, except for any liability which cannot be excluded by law. We are not responsible for technical malfunction of any telephone network or lines, computer online systems, computer equipment, servers, providers, software or traffic congestion on the internet or website, or any combination thereof. We are not responsible for any injury, or damage, you may suffer resulting from participation in, or downloading, any materials in this competition. By entering any of our competitions you are automatically subscribing to our newsletter. You can unsubscribe from receiving our newsletter by simply clicking on the unsubscribe link provided at the bottom of our newsletter. Any information you provide will be held in accordance with our privacy and discretion policy. We use an order form for customers to purchase products. If you place an order with us, we will collect information from you, including your credit card and contact information. This information will be used by us to bill you for products. Contact information from the order form will also be used to ship orders, to contact you for customer service related issues and to send you information about our company. The packaging and images on some products listed on this site may slightly vary from the product received. 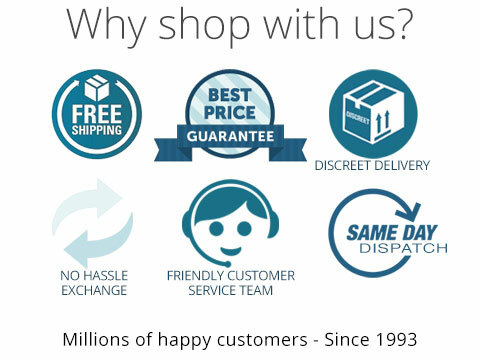 The customer warrants and accepts full responsibility when using any products purchased from this site. We 'The Vendor' will not take responsibility for misuse of products purchased from this site. We 'The Vendor' will not take responsibility for injuries which may result whilst using products purchased from this site. All products purchased from this website should be used in accordance with the manufacturer's instructions. If you are concerned about using any products purchase from this site, we recommend consulting your medical practitioner before using the product. * Customers will be liable for any customs charges, duties, or tariffs for their destination country. * Customers understand that if customs impounds the goods sent from us, charges / cost of goods will not be refunded. * Customers understand that if the goods are returned to us, the customer will be charged for shipping (to the customer and back to us). If you have any questions about our terms, conditions and policies, please contact our friendly customer service team. Visit our Contact Us page for details.